This entry was posted in Humor and tagged air travel, annoying people, dogs, kids, loud people, mean people, meek people, pets, rules made to be broken, vacation. Bookmark the permalink. Damn all youg’uns knee high to a grasshopper! I love it when your spout poetry, R! Poor little Ginger. Not to mention, poor you. Someone needs to turn Dad onto the idea of slipping his kid a Tylenol PM pre-flight. You are an altruistic parent Emily! Agreed! These kids can get away with anything. If you had a taxidermied animal — they would ask you to put it in a carrier for the safety of others (well, maybe that’s not a good example, but you get the picture). A child could just as easily get loose and bite someone! Fortunately, the kid was a non-violent happy screamer shouting for attention from anyone willing to give it. I didn’t spend all my time watching Ginger. The in-flight entertainment system helped drown out the shouting, bu I would have much preferred to read my book than watch TV. Ugh! There is nothing worse than a little snot nosed kid misbehaving while their parent doesn’t do a damn thing. And that poor sweet QUIET dog had to stay in his carrier. They really should have traded places. I feel the same way about the dog and that rambunctious small-fry. I am actually fond of children. I’m always pleased when I see parents that love their kids dearly, but I really wanted to smack that dad who willfully ignored that his fellow passengers were akin to hostages for the duration of that flight. What a jerk! Thanks so much for reading my little tome, Wendy. I appreciate that you took the time to review it on Amazon. That was very generous of you. I am an obnoxious kid magnet on flights. I love it when they kick my seat repeatedly or listen to a video at full blast on their ipad while the parent in a cringingly cutesy voice praises them repeatedly for being oblivious to other passengers. I like the toddler under-seat carrier idea.. a lot. I feel your pain. I once took a flight with a 6-year-old and an 9-year-old that were unescorted. They were seated next to me. The flight attendant asked me to oversee them. I was appalled. I had no interest in babysitting. But they turned out to be two great kids and we bonded big-time. It was the best flight of my life. Saying good-bye to those two wonderful pistols was tough. I’ll never forget them. If you want to read that post click here. It’s as sentimental as I get. Yeah, the joy of flying with children. Yes, I know – not all parents encourage their kid’s noisy discovery of the new experience of flying. But, really – maybe you can’t stop the crying and screaming that comes from real pain and fatigue, but the loud talking and using the plane as a playground just takes a firm parental hand. And stay the hell off my damn lawn! I took my Stella on one plane trip with me. I doped her up but it seemed to have no effect. She almost clawed her way through the carrier, but we arrived in Texas just before she got her head out. Hope you had a marvelous time away. Ease into work slowly. I see kids as essentially innocent, but the parents, they’re the ones that are either geniuses (like my blogger bud, Emily) or lamebrains like that dad. Thanks for the advice. I am so looking forward to my upcoming four day weekend. Thurber has to be one of the cutest dogs on the planet, V. And I remember a flight to Europe several years ago, where a kid screamed all night. So much for sleeping on the plane, and too bad that flight attendant was so grumpy. Ginger definitely deserved better – what a sweetie! Thurber is indeed one of the cutest dogs on the planet, Cathy, as well as the king of affection. I felt sorry for Ginger, but her owner understood the rules, even though she tried to get away with breaking them. I don’t blame her for trying. Wow, that sounded like a hell-flight to Europe! Good point, Savannah. I don’t think a person becomes a jerk overnight. His inner jerk probably just evolved with fatherhood. Oh … the injustice of it all …. and the father-son duo would have driven me bonkers! Meanwhile, welcome back! 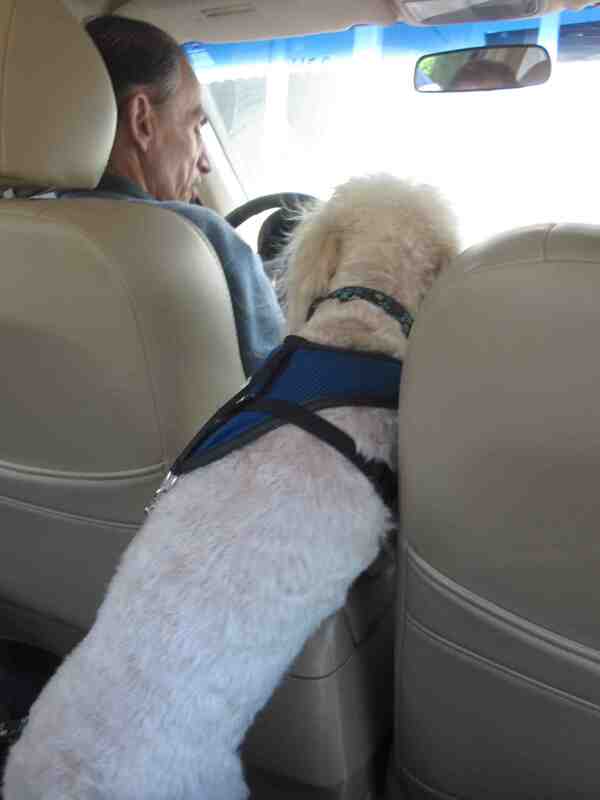 .. and I hope Thurber remembers me on your next trip. I think the tyke could have been a girl, Frank. I could not tell the gender of that little loud person, but they were quite an annoying duo. Thurber remembers people he likes. He knows his letter carrier, not because he hates her. She used to bring him cookies, but then she stopped. It’s possible that some dog owner complained. Thurber sees her and goes nuts. He lets her pet him. Haha. Indeed, I’d agree that no one seems to have the right to utter even one word towards a kid’s parents nowadays, or God forbid dare to say something to the kid directly. I understand the rule about pets, though I’m sure they’d feel safer in the hands of the owner! Unless I had something kind to say directly to a kid, Pixie, I steer clear of the small fry. You’re right about taking on a parent, too. When kids are involved people can go from calm to ninja in a heartbeat, but when you gush that their child is so well behaved or gorgeous, everyone is in their bliss. I love that your family’s fluffy white dog is named Thurber. For me, a Thurber evokes images of a slobbering basset hound. 🙂 But this Thurber is incredibly cute. One reason I always drive to visit my mom is because I can’t bring Reggie inside the plane. (He’s too big to fit under the seat.) I’d be a nervous wreck for the entire flight if he was in the cargo hold. I’d be nervous wreck for both of you if Reggie had to fly cargo, Jackie! Even though Thurber is quite a handsome little beast, and for the most part a well-mannered non-slobberer, his toothpaste is chicken flavor. His breath smells like stale KFC. For Xmas I’m going to look into getting him a mint-scented chew toy. Hope you’re surviving the heat! Peppermint and vanilla — holiday stocking stuffers for Thurber, Jackie! The last time I checked I still had a faint pulse. That’s exactly how my siblings and I were raised Tania. My mother wasn’t joking when she ordered me to keep my yap shut. Once again, Thurber is one of the best dog names EVER. I agree with you about parenting big-time, Maggie. 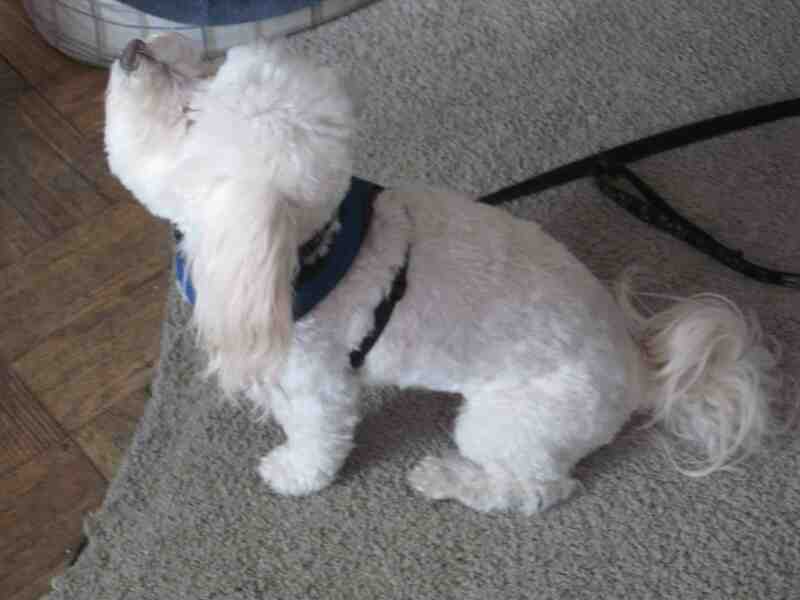 My friend was on her way to pick up Wallie, the Bichon poo I’ve been Wallie-sitting for or nearly 2 wks when I opened your blog post, and, lo, there was Wallie; well, Wallie with a fluffy tail. Such smart, sweet dogs these Bichons are. Wallie is the only dog I know who can bark with a tennis ball in his mouth and not drop the ball. I figured that if he could bark and not drop the ball that he could also tell me what he was barking at, but he couldn’t get the words out. I worked for an airline at LAX and pets used to get loose on the runway all the time. Scary — they’d escape from their carriers in the luggage compartment. An under-the-seat kid carrier — and a muzzle? — is an excellent idea. Why is it kids today emit these screeching squeals? I don’t remember our doing that when we were kids, nor when my daughter and friends were kids. So many kids today seem so stressed. As for your prison matron crossbreed flight attendant, I’m surprised she didn’t exceed the airplane weights and balances limit. Well you’re in fine form once again Samantha! So Wallie’s a bichon poo? 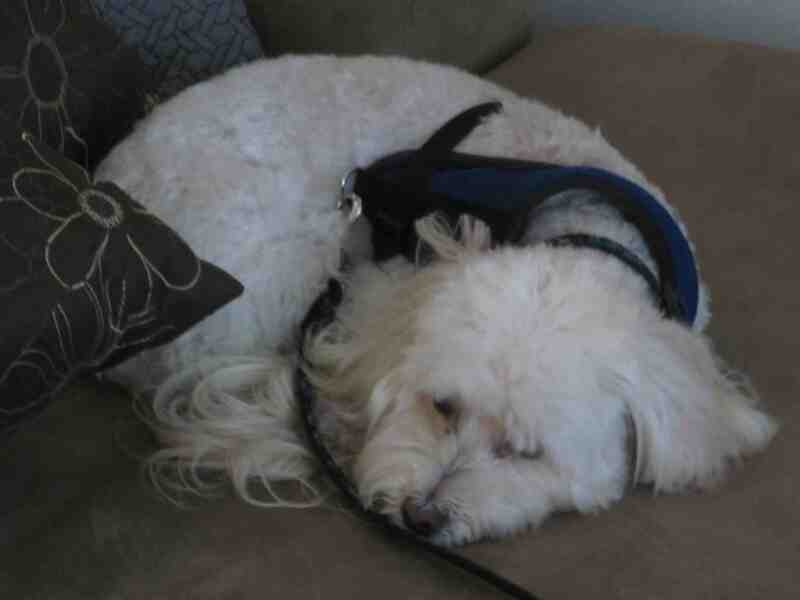 Thurber’s a poovanese (poodle/havanese) — and a rescue dog! He was found as a puppy abandoned in the streets of Tiburon, a very swanky town in Marin County. Dovima and Herb (with a silent h) adopted him in a nanosecond. Thurber does not have Wallie’s bark-while-ball-holding talent, but he’s good at doing both separately. Loose pets on the runway at LAX. How tragic! Somehow when I checked the box to receive follow-up comments, it didn’t register, so here I am now. Better late than rushed. Such a sweet story about Thurber. Wallie is a rescue dog, too. It seems the man who owned him could no longer take care of him, so he went to the SPCA and then a pet store. It’s nice to know that like Thurber, Wallie’s also made a nice rebound, Samantha. Sorry the WP has been glitchy. That would have been a good one, Russell. That kid could have been the next Pavarotti or Beverly Sills, if I could figure out his or her gender. 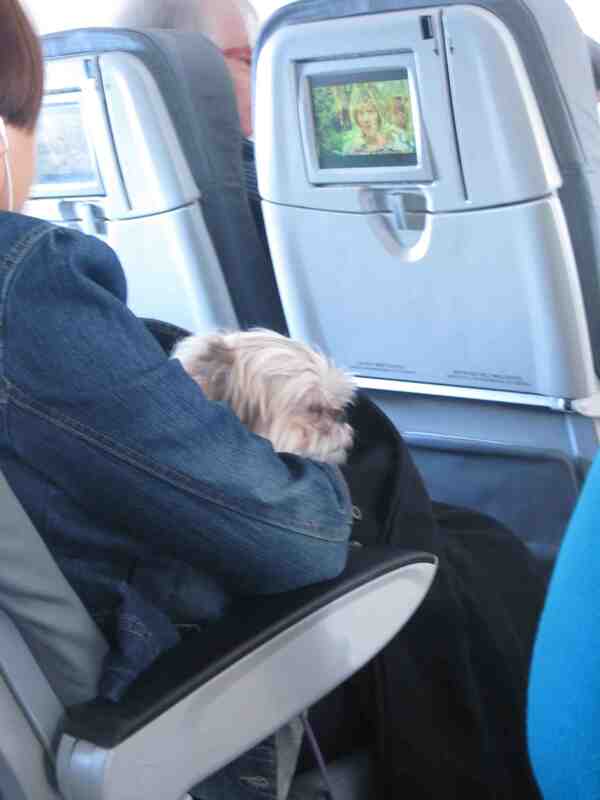 Seeing an adorable little pup like that being cuddled on a plane would be good therapy for white-knuckle fliers like myself. As for Frau Blucher, the JetBlue attendant, she probably knew she wouldn’t get anywhere reprimanding the father of the screeching toddler. I’ll take a planeful of pooches any day. I’d take a planeful of pooches any day, too, provided they’re not the anxious barking types. Thurber would be like that. He suffers major anxiety in the car. I feel your pain! With over 2M miles in the air I have suffered more than my share of toddlers. My rule? I have learned to speak up, children should not be allowed to disrupt others and parents should hear about. I have told more than one parent to shut their child down, asked more than one parent if they were certain of the DNA of their child. Frau Trundler should have been required to do her job. Part of that job is to insure the satisfaction of all passengers. I agree with what you’re saying but personally, I’m pretty spineless when it comes to speaking up about wanting a child to pipe down. Parents are (understandably) very protective of their small fry, something that I think is commendable, but there are some parents out there like that dad that advocates intrusive behavior. He was a big, blockhead type, No one I would mess with. As for insulting the parent about their progeny I would never do so voluntarily. That said, a few weeks ago I was in the Post Office. Behind me was a kid in a stroller; the kind of kid my mother would have referred to as “dynamite”. The mom was distracted filling out a form, the kid was bored, so I started getting kicked in the back of the shins by a pair of little feet in purple Crocs. Me (to the child in a calm nice person voice): Please stop doing that. It’s not nice. The kid thought my irritation was hilarious. This grabbed the mother’s attention. Me (to Mom): Your daughter’s kicking me. Mom (indignant tone): He’s my son! I look at the purple Crocs and for the first time I notice that it’s a little boy clutching a pirate doll. Me: Hey, I was only looking at the feet. Her son tries to kick me again, but I stepped back, so it was a swing and a miss. Mom backed up the stroller, told the kid to “quit it!” and apologized to me. She was okay by me. Kids are kids. Some kids are a pain with conscientious parents and other kids are jerks that are the spawn of jerks. A little dog would brighten anyone’s travels, wouldn’t it? Pets should be allowed to sit on your lap. There! Especially if they aren’t bothering anyone. Sorry about the little brat on the plane. Yeah, it doesn’t seem right that the poor doggy’s owner was scolded. Thurber is a sweet dog! If all the commenting love Thurber’s getting on this site were cookies, Amy, my sister would have one obese little pooch on her hands. But, yeah, he’s a cool little dude. He’d surely be a maniac on a plane, though. Ginger’s in a league of her own, but she’s probably on doggy valium. Clearly a dog is the very best hand luggage possible. I didn’t know you could do that, bring them along with you! I’m glad I know the story of the dog on the place now. My mind was boggling somwehat with all the possibilities. And what a cute dog! On JetBlue via JetPaws, you can bring them provided their small enough to fit in a carrier under the seat, Kate. Unfortunately, this excludes our favorite terrier, Macaulay. 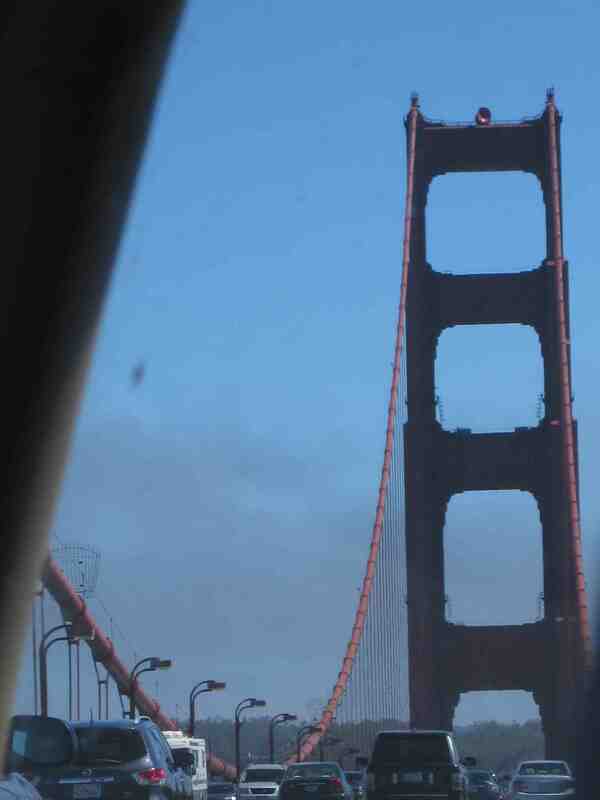 Okay, I’m really late–like a week–getting here. Sorry. But, who knew you had such a soft spot for dogs. I remember you mentioning Milton did, but you said nothing about yourself! Fortunately my Lucy is quiet when flying, as well. I’ve only tried holding her once, and that was on her first trip to Vietnam. I hid her under a blanket on my lap. Know what you mean about the screaming kids. GOD! Welcome to my world, Kathy. Great to hear from you! Hey, I’m so behind in my blog reading, there’s no way I’ll ever catch up. I do have a soft spot for dogs. It’s cats that drive me over the edge — only because I’m deathly allergic to the kitties. I’m not surprised that Lucy is the model dog-flyer. Too bad that Ralph’s stuck riding cargo. I love that image of a plane clapping its wings! It occurred to me, too, that Ginger was offering her owner comfort, but the owner obeyed by the rules when told to do so. Both she and Ginger were two class acts. Too bad that boisterous kid wasn’t a member of their group. The palne would then have a whole other reason to clap its wings. Good one-this time!-I would have taken her out again as soon as the attendant left-then stuff the kid in the cage!